All in the family. Image via metromba.com. I say it often: Teaching is pretty much the Family Business. My mom was a school nurse in East Chicago, Gary, and Hammond for 30 years. My mother-in-law taught elementary school for 21 years, and now in retirement is a classroom aide in Las Vegas. My older brother was a civilian instructor for the Navy during his 30 years in the Army reserves. And my uncle (an engineer and then a lawyer) taught middle school math while he was in grad school. My oldest son has his heart set on police work, which is cool. I personally think he’d make a great history teacher, an area of personal interest for him. But in the meantime, he is (among other things) a Life Teen Junior Core Member at our parish. So, he’s doing a little teaching, usually in small-group settings but often addressing a room full of high school students after Mass on Sunday evenings. So Sunday morning he’s preparing a talk he’ll give to high school students later that night about “accepting difficult teachings”. No pressure, right? Also, somewhat ironic. Staring at a blank google doc that stays blank is very frustrating. Especially when the clock is ticking. It’s his talk and he’s gotta write it, but… Can I help? Because 900 performances a year for 14 years has to be worth something to somebody. And, teachers gonna teach. And thus I introduced my oldest to the Backwards Assessment Model and the concept of a hook. He settled in on using some anecdotes from a concert that we (and several of the kids he’d be talking with) all attended the night before. A comment made by the lead singer while introing a song really stuck with him, and I suggested that if that line spoke to him, it probably would resonate with his audience too. It was a common experience that they could all use as an anchor. He was wise enough to see that would be a great tool for getting buy-in for his talk. Type words and phrases as they come into your head. before they evaporate. Don’t worry about complete sentences, or even punctuation. You can flesh it out later. Get the important points down and go from there. Use all your resources. Life Teen publishes a guide book with suggestions for each Life Night. Is there anything in there you can take and run with? Especially with the more technical parts of your talk? Develop a theme or conceit. Is there a phrase that summarizes your point? A little repetition can be a valuable tool for getting a point to stick. Write like you talk. The Talk has to be in your voice. I could tell it sounded like him just by peeking over his shoulder and reading a few lines. Get another set of eyes on it, especially for proofreading (grammar and spelling). And one from my radio days: Read it. The whole thing. Out loud. You’d be amazed how a clever turn of phrase on paper turns into a tongue-twister when spoken aloud. Writing themes and persuasive essays was not my son’s idea of a good time in high school. But here, a few years later, given an opportunity to tell a story that mattered to him, he put together a solid presentation. He came home Sunday evening feeling like things went pretty well. Cool. I was happy for him. And glad I could lend a hand. Because Teachers Gonna Teach. In and out of season. I heard a story the other day from a woman starting a new job. She was told by the company’s most senior account executive that the average length of employment for sales staff there is six months. He himself had been there all of two years. There are jobs out there, people… that will grind you up and spit you out. I love my job. Teaching is awesome. It’s pretty much guaranteed that somebody’s gonna do or say something to crack me up every single day. And don’t tell anyone, but: I love summers off. Don’t @ me. We all need a chance to recharge. Yeah, I’m getting my planning done, slowly, but let me tell you: Afternoon Naps are pretty sweet. But these days I’m starting to look at the End Game. I think often these days about a couple of teachers I’ve had the opportunity to work with, one as a colleague and one who was a coach during my days as a sportscaster. Good men. Both of these guys put in their full 30 years in education. Both worked closely with students in the classroom and in athletics. They literally gave their lives to kids. And both died far too young, one just before finishing his career and another just after. You just had to read the Facebook testimonials from former players, or see former students at the wake, to know what these guys meant to the young people who had been around them. Anecdotal, I know, but what I am coming to recognize more and more is: There is no retirement. Especially not as it was sold to Baby Boomers throughout the late 20th century – a Del Webb home in The Villages or Summerlin, an RV to ramble across the country visiting grandkids, an occasional cruise or European vacation. Take a look at the state of public pension plans these days. Most of us are going to work until we die. So, what’s a life of service worth? That last sentence from Blessed Oscar Romero is featured on the back of one of the Spanish National Honor Society shirts at my school. Fitting, because that’s teachers, right there: our value is not in what we have, but in what we are. Here’s more Romero: “There are many things that can only be seen through eyes that have cried.” That’s teachers, too. Pope Francis declared the Archbishop of San Salvador a martyr in 2015. He’ll be a saint soon. Not sure Francis had teachers in mind with this declaration. It’s more directed towards those who give their lives through extreme charity, working closely with people with contagious diseases, for example. I hate that whole “teacher-as-martyr” meme worse than most folks hate the “super-teacher” meme. I can definitely see the connection though. But: Here’s the deal, Catholic or not. We’re in. For life. We’re not Saints, most of us teachers. But we can be “little-s” saints. We can live joyfully. For others. It’s not a burden, it’s a blessing. So keep gathering those roses. It’s July now. It’ll be December soon. What do kids really want their school to be like? Does that match up with what we offer our kids at school? From the “Play Like A Girl” presentation by Dr. Julie Evans. Almost 100,000 Indiana students, parents, teachers, and administrators responded to the “Speak Up” survey. His daughter has some ideas too, and presented them to us at the SouthShore e-Learning conference in Hammond. Apple doesn’t fall far from the tree, obviously. She’s self-taught on a lot of web tools, mostly because her dad gives her the freedom to find and use the tools that help her learn, and express her learning. That graphic from the Speak Up survey up there? The one that shows what tools kids want in their dream classroom versus what adults think is needed for kids to learn? Brooke and her dad don’t just give that lip service. They live it. On fire, man. So: What if we could blow the whole thing up and start over? What would that look like? We can’t rebuild institutional school, but we can change what we do and how we do it within the existing framework. That’s how I’m approaching the coming school year. My school is going 1:1. We have a unique opportunity to rebuild how we “do school”, what lesson design looks like, how students interact with us, with each other, and with the math. Close your eyes. What do you see and hear when I say “punk rock band”? OK, so strictly speaking, not “a band”. Young Ones image via the BBC. RIP Rik. I don’t imagine too many teachers or administrators will be mistaken for punk rockers. But like Dewey Finn’s kids in School of Rock, we can steal a little bit of the ethos. I’m currently reading Route 19 Revisited by Marcus Gray. It’s the 500-page backstory of how the Clash made their seminal double-album London Calling. They lived punk. They looked punk. But the sound drew on a variety of influences, including early R&B, blues, rockabilly, reggae, pop, and jazz. And while the stereotypical punk rock song is raw and unsophisticated (“volume, velocity, and aggression”, as Gray puts it), the Clash took its time to craft its masterpiece. Image from Marcus Gray’s “Route 19 Revisited”. So: Now’s the shot. A chance to take a little bit of this, and a little bit of that, and build something awesome. This tool and that one, and remake my Algebra II classes. My kids are gonna walk in every single day with a laptop. That device can either be a paperweight, a distraction, or an awesome tool for learning. My option. I’ve been building my toolkit for years. Tweaking and adjusting. Borrowing from Vaudrey and Nowak and Nowak some more and Carter and Meyer (of course). There’s more though. Jonathan Claydon has some cool stuff he’s doing to leverage tech in his class, and his students are climbing way up the DOK ladder. Chevin Stone modeled hyperdocs for all of us at Gavit. Just the thing to put all the student learning tools in one place. There are a literal ton of resources online, and a book. At South Shore e-Learn Katie Bradford shared some cool tools for use of video in lesson design. I see this as an opportunity to go 2:1, pairing students up to annotate a quick video on the skill of the day. I’m already down with Desmos Activity Builder. Now’s a shot to build in some activities where the ROI was way too low for checking out a cart and getting everybody logged in. On-demand tech means Card sort, Polygraphs, and Marbleslides will all debut this year. The wildcard is MyMathLab. Several of our teachers who have on-demand access to carts have been using this Pearson tool on the daily to create practice exercises and assessments. It’s actually an expectation within the district. I picture it as a way to create extensions and additional practice as a way to differentiate for students. Gonna need some tutorial there though. So much in my head right now. Image via Giphy. So that’s a lot of tools to sort through. It’s gotta be done though. The shift to 1:1 can be done well, or done poorly. It’s too great an opportunity to fumble away. It can’t be just, OK, kiddies, open your computer, here’s the lesson, pencil/paper just like its always been. The laptops will be an afterthought. Forgotten. Left in lockers. Or worse, I use them as a $300 worksheet. And it will be an opportunity gone by the wayside. Instead, I’ve got an chance to build on what’s come before, give it my own personal touch through several rounds of revision, and who knows, maybe turn out a masterpiece. The Family Tree of Rock. Via The Odyssey. 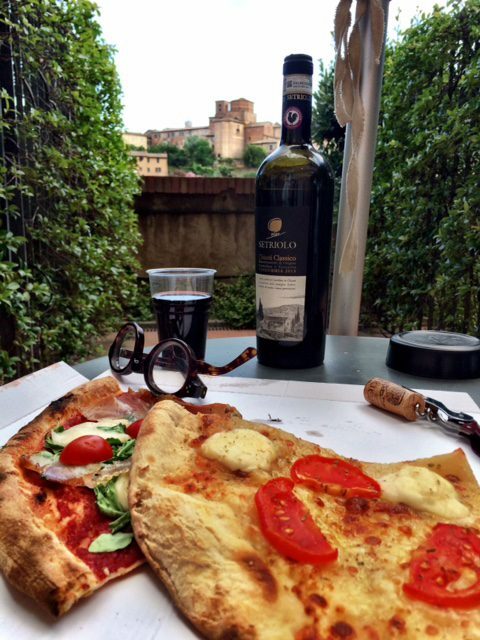 A couple of the smart people I follow online are in Italy this week, writing/posting about their experiences. And they are stirring up memories for me of chaperoning my youngest son’s church choir trip to Rome last Christmas. The Umbrian Valley is breathtakingly gorgeous. Views like that stay seared in your brain. Meanwhile the great Rod Dreher is traveling with his son, who happens to be the same age as my youngest. Italy. So beautiful. Simple pleasures on the table of a hotel balcony. Via Rod Dreher‘s blog at The American Conservative. I’m basically a dark person. I look for that stuff – the Not-Beautiful parts. Rome has roughly the same population as Chicago. Most of the same problems too. I saw the homeless people living in the walkway from the parking garage to the Vatican. The panhandlers on the streets of the city. The multi-faceted security system at the front door of our pensione, which fronted a neighborhood side street. And the tent cities off the side of the highway leading from our neighborhood to the airport. Right now, hidden from view behind the wine and the pizza and the mountains and the beauty and the people, there are bank bailouts and super-high unemployment and below-replacement-level birth rate. But you hold on to the beautiful memories, and keep in mind the troubles, even when it’s time to go back to work. They are the stuff dreams are made of. Like Pete’s dad said, having dreams is what makes life tolerable. And for teachers, summer is one long Dream World. You have no idea how hard I’ve been sleeping in on weekends these days. But in the immortal words of Midnight Oil, your Dreamworld is just about to end. The answer, of course, is “D”. But most recently Mrs. Dull uttered those words. Because when the municipal fireworks show Grand Finale has dissipated and the cookout is over and the fire on the beach is put out, it means summer is over. (But but but but… there’s still 5 weeks left, right? Yeah, but from a parent standpoint that’s just 5 weeks of budgets getting busted while mom and dad get clothes and shoes and Clorox wipes and notebooks and pencils ready for back to school). And for teachers, well, so much for Netflix and naps…. there’s work to do. I bumped into one of my fellow math teachers after Mass today. I played it cool when we talked summer and planning and textbooks and curriculum maps, but in truth I can already feel the low-grade anxiety setting in. Time to start thinking about August. There should be a plan tho, shouldn’t there? Yeah. I think I’m more likely to get stuff done if I plan it on paper, on purpose. Maybe make an actual schedule, like a daily planner, day by day, hour by hour. Plan intentionally. One of my college buddies (and Saturday night radio show co-host) was my model here. Jack made a weekly grid on graph paper, using a pencil, a ruler, and some highlighters. He blocked out the time for his classes, studying, meals, sleep, social/entertainment time, tacked it up on the corkboard above his dorm-room desk… and stuck to it. He’s a better man than I am. That’s cool and all, but definitely for printing out. Can we get Googlely with it? I think so. (Courtesy Richard Byrne). As my running friends like to say when wrapping up marathon training and beginning a taper, “The hay is in the barn. Now all that’s left to do is run your race.” Because the dreams are so much more pleasant when you’ve taken care of business.